How does a French-born former press photographer wind up in far-north Queensland managing the post-harvest for a well-known chocolate company? Is there anything that captures our hearts quite like a few (read: a few too many) squares of chocolate? Whether it’s because of the antioxidants and endorphins, laden in every bite, the proven links between it and a longer, happier life or its exotic origins, chocolate remains a universally adored indulgence in all its many forms. Having worked with and around chocolate in Australia (first Sydney, then Melbourne and now far-north Queensland) for the better part of two decades, his reverence for chocolate is hardly surprising – he’s absorbed it, soaked it up, carved a career out of it. These days, chocolate is Fregoni’s lifeblood, which is probably a notion many of us can relate to. His foray into the world of chocolate began in Sydney in the early 2000s while he was experimenting as a pastry chef, and has since culminated in a position at Daintree Estates Chocolates in Mossman, North Queensland, where he manages the company’s post-harvest facilities. “My job is overseeing the fermentation and drying of the cocoa, which are essential steps in creating good chocolate,” he says. From cacao to square... Fregoni shows us the magic to behind chocolate-making. Good chocolate: this distinction may not be pertinent to anyone with serious cocoa cravings on their way to the supermarket for a quick fix, albeit of the mass-produced kind. For the casual consumer, chocolate is chocolate. Sounds easy enough, right? Of course, Fregoni has a few tricks of the trade: “Ideally you’ll have a stone grinder to make your paste, but you could use a mortar and pestle for a small trial,” he says. “Chocolate doesn’t like strong odours and humidity, so wrap your chocolate well and place it in an airtight container. Try to bring the container to room temperature before you open it to avoid condensation.” Don’t beat yourself up if you can’t wait – the master himself admits to not always having enough patience for this last step. With Christmas approaching faster than we’d like, the prospect of making chocolate as an edible gift may excite some as much as it may daunt others. Luckily for the latter group, the chocolate and cocoa industries both in Australia and across the world have boomed in the last decade – and there’s never been a better time to seek out the best chocolate the world has to offer. When it comes to playing favourites, Fregoni’s French heritage is a clear factor. “France has to be the best, of course,” he says. “Followed closely by Italy and Switzerland. But don’t underestimate Australia – even though we are so young comparatively, we manage to produce some beautiful products. There is great potential for a cocoa and chocolate industry to develop and succeed.” For anyone looking to stray beyond Lindt on their next chocolate shop, Fregoni suggests Valrhona from France and Felchlin as first ports of call. 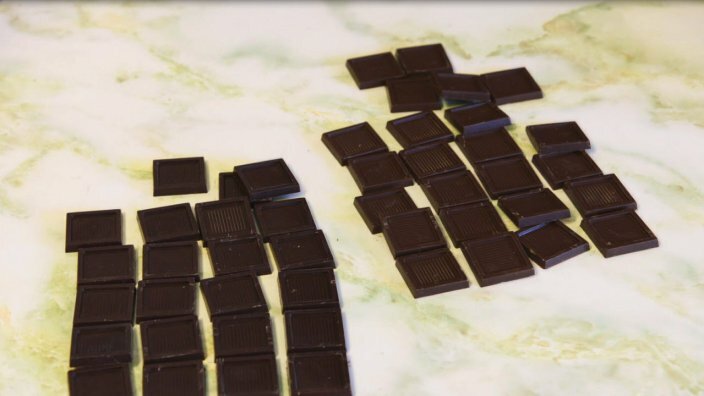 “They both manage to produce stunning chocolate on a fairly large scale, which is no easy thing.” But Fregoni pays mind to the little guys, too. Recently, an emerging talented chocolatier named Yoon Kim caught his attention. Her business, Smooth Chocolator is leading the way in smaller scale chocolate production in Melbourne. And if you do choose to buy rather than make your own this Christmas, Fregoni has some final words of advice: “buy less, but better and make sure you share with friends and family,” he says. Perhaps easier said than done for most chocoholics! We're admitting to an aerated addiction of the chocolate kind and declaring our allegiance to all choc mousse incarnations. Chocolate in cake, in pudding, in icing... but in your lasagne? On your ribs?! Oh, yes. Here are a few recipes that show the sweet stuff's savoury side. A cross between a mousse and gelato, this semi-frozen dessert is a great one for summer as you don’t need an ice-cream maker. Making baking decisions easier. Our five best. From rich dark squares and gluten-free delights to salted peanut "brookies"- brownie-cookies - our Bakeproof column takes the brownie to new heights. We all know chocolate loves caramel. But have you seen the dance it does with these unexpected partners? Meet miso brownies, "the best gluten-free muffins I've ever tried" and lush Hawaiian coconut milk pie.